Below is an attempt at a guide to setting up full node that covers all that one might need it to cover. Please post with any questions, comments about how it could be improved, or things that I have missed. Full nodes form a core part of IOTA’s underlying infrastructure. Their role is to exchange information with other nodes about the status of the network and the details of. Other applications that use the IOTA network also make calls to full nodes in order to retrieve and add information. For example, when you are running the IOTA Lightwallet, it is connecting to a full node somewhere else to allow you to send and receive transactions. It is worth noting that where other programmes are making transaction calls to a full node, the proof-of-work for those transactions is done client side (e.g. by the computer running the Lightwallet), so your full node is not doing their labour. One of the great things about IOTA, and fundamental to how the Tangle works, is that the processing of transactions is entirely done by the users that are creating transactions themselves (i.e. when I want to issue a transaction, I first need to validate two previous transactions). This does away with the mining and transaction fees present in other cryptocurrencies like Bitcoin. However, it also leads to the assumption that there is no incentive to run an IOTA full node. Luckily, this is incorrect and there are valid reasons. you may be a nice (or financially invested) person and want to run a full node because it helps the network. In terms of system requirements, 2-4 GB of RAM, 2-4 CPU cores, around 10 GB of hard-drive space, and at least 1Mbps upload speeds should suffice. It is also important that you can keep your full node running 24/7, or as close to this as possible. People will be relying on your full node to communicate transactions, and just like how people will avoid a bridge if it is frequently washed-out, people will avoid your node if it is often offline. This is especially important as IOTA currently relies on manually connecting to neighbours. If you do not have a computer that you can have running 24/7, you can also run a full node on a cloud provider like Amazon Web Service. As IOTA does not yet have automatic peer discovery, it is important that you are using a static IP with your full node. A static IP is just an IP address that doesn’t change, as opposed to a dynamic IP that does. If you don’t know what type you have, go to http://whatismyipaddress.com/ and then click ‘Show Me More About My IP’. Along with a bunch of other information, the ‘Assignment’ field will tell you what type of IP you have. If it is already static, then you can move onto installing the node, otherwise keep following on. For the next step, we will be attaching your dynamic address to a hostname, which then functions as a static IP. This is based on the guide by Lukas Fiedler, which you can read here. First, head to https://www.noip.com, register an account, and create a hostname. The basic service is free; however, you will need to renew your hostname every 30 days. If you don’t want the hassle, it costs around $12 a year. Next, download the NO-IP DUC program from https://noip.com/download?page=win. This programme runs in the background and updates noip when your computer’s IP address changes, ensuring that you remain connected to your hostname. Now open up NO-IP DUC and we can check if all is working. Open the terminal and enter ‘ping <YOUR-HOSTNAME>‘. If the terminal outputs something like what is below, everything is working. If it doesn’t work, the most likely problem is your router so we need to fiddle with some settings. Find your router’s local IP address and enter this into your favourite web browser. 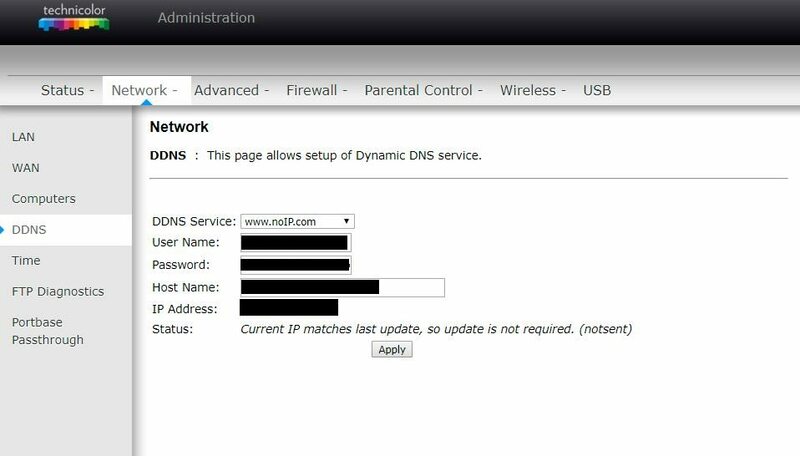 Then log in and find the page for your DDNS/DynDNS settings. Select noip for the DDNS service; enter your noip hostname, user name, and password; and click apply. An example of what the router page may look like is here: https://i.imgur.com/p7Dinaj.jpg. If noip is not an option on your router’s DDNS settings, you will have to get googling to find a solution. The key choice in installing a full node is whether you want to run a headless node or a GUI based node. The GUI version is easier to install and use as it runs from the same programme as the Lightwallet. A headless node is run from the command line, which some people prefer, it also looks impressive to none technical people to have screes of text rolling down the screen. Alright, so you have gone for the GUI option. The first step is to download the latest release of the IOTA Wallet. Head to https://github.com/iotaledger/wallet/releases, then download the appropriate package for your OS. While you are there, also download the latest version of the IOTA IRI Mainnet from https://github.com/iotaledger/iri/releases, we will need this later. As of writing, this file was called ‘iri-1.4.1.2.jar’. 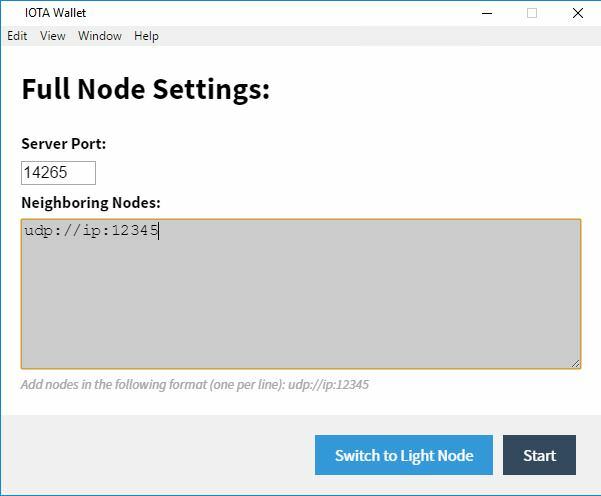 Now start installing the wallet and you will be prompted if you want to install a light node or a full node, select full node. You will then be prompted to enter the details of your neighbouring nodes, as seen here https://i.imgur.com/eIE9mvY.jpg. We are just going to ignore this for now so put in some filler address like ‘udp://ip:1245’, and press ‘Start’. You will now likely get an ‘Initialization Alert’ saying ‘Error: Unable to access jarfile’ and then giving you a file path. Copy the IRI jar file you downloaded earlier into this directory (you might need to create the ‘iri’ folder), and then rename the file so it is just ‘iri.jar’. Click ‘Restart’ and the wallet should open properly. Alright, we are now ready to find some neighbours and get your node connected. Great, so you have chosen screes of text. Head to https://github.com/iotaledger/iri/releases and download the latest version of the IOTA IRI Mainnet, it was called ‘iri-1.4.1.2.jar’ at the time of writing. Now create the directory where you want to set up your headless node and move the jar file you downloaded into here. The next steps will vary depending on your OS. The ‘14265’ is just the default port number for IOTA, so feel free to change this if you want. Now we just need to set up your INI File, find some neighbours and you are ready to go. For more detail on installing on Linux, including compiling yourself, check out Scott Tudd’s guide here. If you have done the above correctly for Linux, Windows, or OSX, that precocious text will start flowing, but it won't be actually doing anything without some neighbours. However, first we need to set up an ini file for your headless node.This will store some useful information about your node, including the details of your neighbours. To connect to another full node, both nodes need to have each other’s details. What you need to know is your IP address, your UDP receiver port, and your TCP receiver port. Get your IP address from going to http://whatismyipaddress.com/. If you used noip, get your IP by typing ‘ping <YOUR-HOSTNAME>‘ into the terminal. 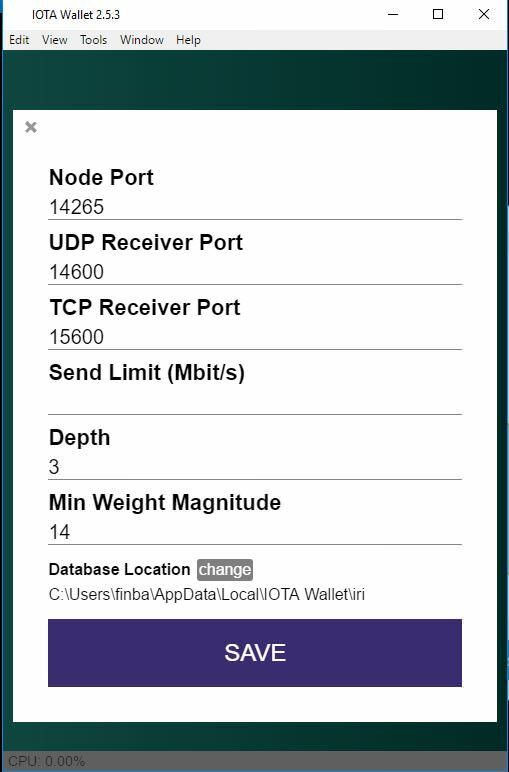 To find your TCP and UDP ports in the GUI, open up ‘Edit Node Configuration’ under the tools tab of the IOTA wallet. Your port numbers will be displayed, and you can change these too if you want, it looks like this: https://i.imgur.com/PTvCox2.jpg. From this you will get two addresses: ‘udp://<your IP>:<UDP Port> (e.g. udp://192.345.2.5:14603) and ‘tcp://<your IP>:<TCP Port> (e.g. tcp://192.345.2.5:16890). If you are going headless, use the port numbers you set in the INI file. Now it’s time to find some friends. Take yourself over to the official IOTA Slack and join the #nodesharing channel, if you are not a member, you can sign up here: http://slack.iota.org. Alternatively, go post in the Node Sharing forum at https://forum.helloiota.com. Take care not to just post your details for all to see, just say you want to find some neighbours and then swap details via DM. Once they have sent you their details, send them either your UDP or TCP address. Either add their details to your INI file (for headless) or open up the GUI, click ‘Edit Neighbours’ under tools and add their details there. There you go, once your neighbours add your details your full node will start synchronizing with the network and you can go have a cup of tea. Finally, it is important to remember that there is an optimum number of other nodes to connect to. Currently, this is around seven or nine neighbours. More than nine is not advised against as you are actually harming the network. If you have got this far and realised that a full node is not for you, there are other ways you can still use your computer to help the IOTA network. This is by spamming transactions. Because when you issue a transaction you have to validate two other transactions, just by issuing empty transactions you can help make IOTA stronger and faster. To do this, go to https://prizz.github.io/iota-transaction-spammer-webapp or https://www.mikrohash.de/iota/spamfund, the latter one even pays you some IOTA for spamming. This guide looks very helpful, @Finbar, so thank you. But since I am a non-techie, I am already falling into some gaps. I want to set up a full node in the cloud, and I am not sure how to even get started. Following the line that ends the "What you need" section, "...a cloud provider like Amazon Web Service," I need guidance. The AWS page has far too many options. Go to https://aws.amazon.com/ and click Products. Where do I go from here? Please don't give me too many options and ask me to choose, since I am a non-techie. I am very comfortable with instructions like "Select X and set it to Y," even if it's not the absolute best most perfect thing possible. I just want to get it going. Also, I am not trying to get free hosting. I expect to pay for 24/7 up-time. Hi Spartacuss, I don't have experience with setting up on AWS sorry (i just brought a cheap second hand box for my node). But I am planning to look into setting up on AWS when I have the time. In the first instance, I recommend asking some questions #nodesharing at the iotatangle slack. There are lots of people there who use AWS and can help you. You can also setup a Static IP in your computer's Network settings. I am trying to set up a GUI full node and copied the iri file to the folder as suggested. When I try to start the node I got the below error message. Not sure If I am doing something wrong. Any help is appreciated! My System: Windows Small Business Server 2011 Essentials, 32 GB Ram, Xeon Quad Core CPU, 3 SSD´s, 100 Mbit FTTH internet connection, Java version JRE 8u151 (same problem with JRE 8u152). The Port for the Node is in Windows and in the Router open. I have Java reinstalled with various Versions. Nothing helps. IOTA is a good idea and I want to help to bring it to the top! Since this version iotaledger/iri does not start from executable jar file. Did IOTA give up Windows?